This week Independent Fashion Bloggers project is to show off your childhood fashion sense. Honestly, I wasn’t the most stylishly well dressed kid or someone who wore trendy outfits. But, I loved to play dress-up. I would wear my mom's bangles and run around the house. Or take one of her dupatta's (Indian stole) and style it like a saree. Even though blue is my fave colour, I learnt that red or shades of red suits me the best. Not only do I look and feel great in it, but I also photograph amazingly well in red. 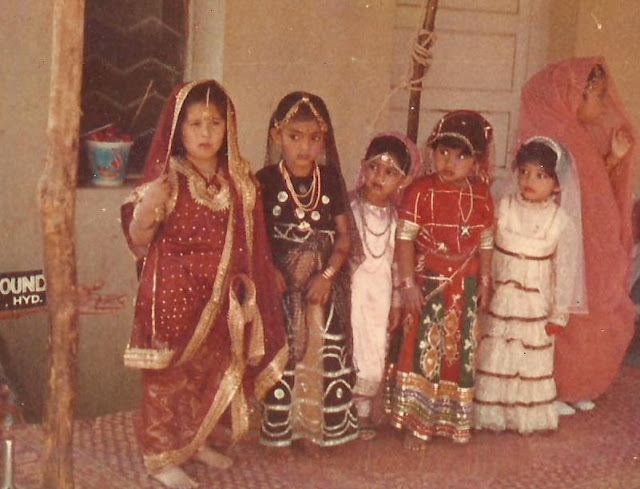 Dressed as a traditional Hyderabadi bride for my school's 'Brides of India' pageant. 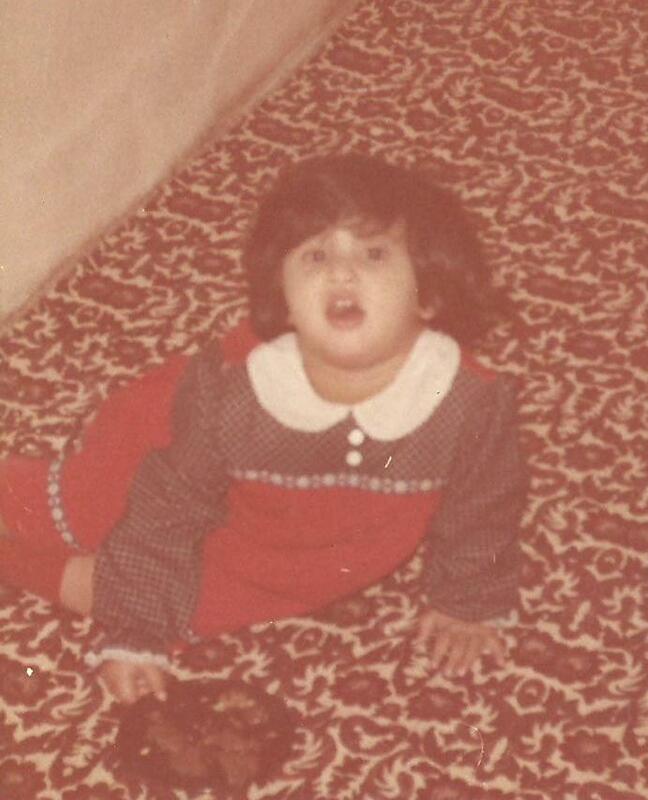 From a young age I learnt to give ‘the pose’. You know, the one that captures your best profile shot and hides all the flaws! Celebrating my younger brother's first birthday. I miss kiddie birthday parties. The cake, the games, the fun. They were the best. I learnt to accessorize even before I learnt to walk. A true fashion lover, ain't I? I am totally rocking my grandmother's necklace. 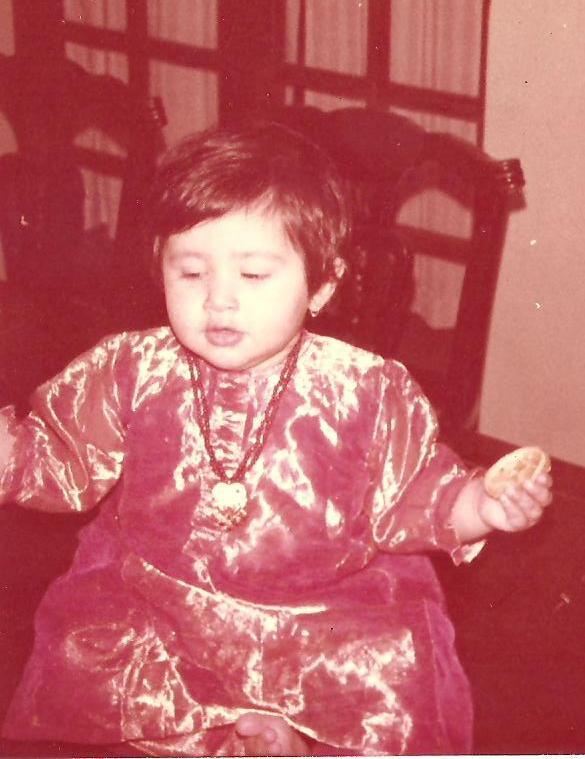 Even as I kid, I knew how to use food as a prop for a photo and never be caught with your mouth full. Someone once said, "Childhood is the most beautiful of all life's seasons." And looking at these photos I couldn't agree more. We can't reclaim our childhood, but we can revisit them time and again. And I had a wonderful time walking down my memory lane. What are your fave childhood memory? Like me, did you as well play dress-up with your mom's things? Do share your chilhood stories with me in the comment section. OMG, you are so cute!! Congrats for the Blogger project feature! !Hope you are having a wonderful day! How cute! I loved playing dress up but never looked as good as you do! Such beautiful heritage! Thank you so very much. One of the best compliments ever I have gotten. Made my day. Thank you Ayantika. You are so very kind. I grew up with two younger brothers I had my 'boy' moments too. Quite often actually. Thank you for you kind words. This is really so cute :) Innocence to the max . Thank you Shilpi for your kind words and follow. Cutie!! I'd done a kiddie post too a while ago! Trust me I miss those days!